"Isn't It Bromantic?" There's a new hunk in town and Veronica has her sights set on him. She latches on to Kevin, but despite her increasingly persistent attempts to get his attention, he's just not interested! 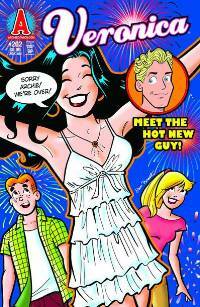 Jughead takes advantage of the situation and uses them both in his quest to play Veronica for a fool. In the end, will Jughead turn out to be the real dunce? First appearance of Kevin Keller.